De plane! De plane! 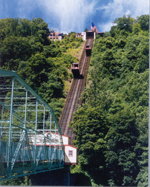 Me at the world’s steepest inclined plane in Johnstown. Today I got to spend the day with my niece Macenzie introducing her to the mountain biking trails over at Prince Gallitzin State Park. We’ve ridden most of the road rides around the area, but she’d never been on the dirt and was anxious to check it out. She loved it! I might have another mud bunny in the family. (My sis is going to kill me.) We rode the Killbuck Run Trail (scene of Wayne’s famous yard sale) and she did great. She said it was “epic.” I think we’re going to head over to the 36-mile Ghost Town Trail tomorrow or maybe hit the Staple Bend Tunnel Trail. She definitely has the riding bug and I love getting out with her on our weekends. ~ by maddyrides on March 6, 2010.